1677: born in the province of Yamato in a farming family. End of the 1680s: he started his career as a wakaonnagata, performing in tabi shibai under the name of Kozakura Rinnosuke. 1695: he took the name of Kozakura Rinzaemon. 1st lunar month of 1705: he took the name of Yamatoyama Jinzaemon I and, thanks to the patronage of Sakata Tôjûrô I, became tachiyaku in Kyôto. Fall 1706: Jinzaemon settled in Kyôto. 11th lunar month of 1706: Jinzaemon played in Kyôto at Hayagumo Chôdayû's theater the role of Sukeroku in the kaomise drama "Sukeroku Shinjû Kamiko Sugata". 3rd lunar month of 1707: Jinzaemon's rank in the Kyôto hyôbanki, tachiyaku section, was jô (superior). 7th lunar month of 1707: Jinzaemon played in the same theater the role of Denjirô in the drama "Uta Makura Kaikoku Saigyô Hôshi". 1st lunar month of 1708: Jinzaemon's rank in the Kyôto hyôbanki, tachiyaku section, was jô-jô (superior - superior). 11th lunar month of 1711: Jinzaemon performed in Kyôto at Hayagumo Chôdayû's theater in the kaomise drama "Tsurukame no Aimuko". 3rd lunar month of 1712: Jinzaemon's rank in the Kyôto hyôbanki, tachiyaku section, was jô-jô-(shiro)kichi (superior - superior - (white) excellent). 11th lunar month of 1714: Jinzaemon played in Kyôto the role of Wataya Shôzaburô in Sadoshima Saburôzaemon's kaomise drama "Yorozuyo Saiwai Gura", which was staged at Miyako Mandayû's theater. 1st lunar month of 1715: Jinzaemon's rank in the Kyôto hyôbanki, tachiyaku section, was jô-jô-kichi (superior - superior - excellent). He shared the same rank with Shibazaki Rinzaemon I and Shinozuka Jirozaemon I. 11th lunar month of 1715: Jinzaemon produced in Kyôto at Hayagumo Chôdayû's theater the kaomise drama "Chiyogasane Kiku no Shinpai". 11th lunar month of 1716: Jinzaemon produced in Kyôto at Hayagumo Chôdayû's theater the kaomise drama "Tatsu no Miyako Ikuyo no Yonedawara", where his adopted son Yamatoyama Sensuke made his debut on stage (hatsubutai) as a koyaku. 11th lunar month of 1717: Jinzaemon produced in Kyôto at Ebisuya Kichirôbê's theater the kaomise drama "Genjôraku Biwa no Ôumi", in which he played the role of the motoyuiya Kyôsuke, in reality Goinosuke. 11th lunar month of 1718: Jinzaemon produced in Kyôto at Ebisuya Kichirôbê's theater Adachi Saburôzaemon's kaomise drama "Shiga no Miyako Kogane no Hanazono". 11th lunar month of 1719: Jinzaemon produced in Kyôto at Ebisuya Kichirôbê's theater the kaomise drama "Hôraisan Hiyoku no Tsurukame". Fall 1720: Jinzaemon and his son Yamatoyama Sensuke went together to Ôsaka. 11th lunar month of 1720: Jinzaemon played at the Naka no Shibai the role of Honma Sukejûrô in the kaomise drama "Daimyô Nishiki no Kusazuri", which was produced by the zamoto Takeshima Kôzaemon II. 1st lunar month of 1721: Jinzaemon's rank in the Kyôto hyôbanki, tachiyaku section, was jô-jô-kichi (superior - superior - excellent). He shared the same rank with Arashi San'emon III, Takeshima Kôzaemon II and Osagawa Jûemon. 7th lunar month of 1721: Jinzaemon appeared on stage for the last time, in Ôsaka at the Naka no Shibai. 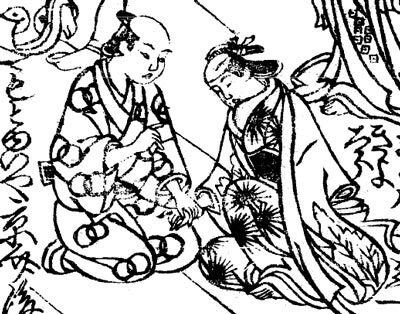 19th day of the 7th lunar month of 1721 : Jinzaemon suddenly died in his home in Ôsaka. Yamatoyama Jinzaemon I was a great tachiyaku actor, who achieved fame for himself in Kyôto during the 1710s. He was outstanding in many different fields, like nuregoto, yatsushigoto, budôgoto, jitsugoto, shosagoto and even aragoto. He was considered as the father of yatsushigata in Kyôto. The 19th day of the 7th lunar month of the 6th year of the Kyôhô era was the 11th of August 1721 in the western calendar.